His goal against Mexico on March 27 was the first for a U.S. player in Mexico since 1984. The goal proved decisive when the US finished ahead of Mexico at the top of the qualifying group thanks to having scored one more goal. Lewis started his career with San Jose in MLS before moving to England in 2000. He stayed in English soccer until a return to MLS with the LA Galaxy in 2008. 2008: Played final 20 minutes of February exhibition game against Mexico in Houston. Came on as a sub against England at Wembley on May 28th. Captained the US against Barbados on June 22nd and also scored the game’s only goal. 2007 – Made first appearance of year in 1-0 exhibition win over Switzerland in Basel, playing first 84 minutes. 2006 – Made five appearances for the US National Team, including two starts in the 2006 World Cup for Bruce Arena. 2005 – Played in six of 10 final round qualifiers, all as a starter. Scored in the opening final round qualifier against Trinidad, taking a feed from Landon Donovan and finding the right corner of the net to tally the game-winner in the 2-1 victory on February 9 in Port of Spain. Finished on another Donovan pass to score USA’s lone goal in the 2-1 loss to Mexico on March 27. 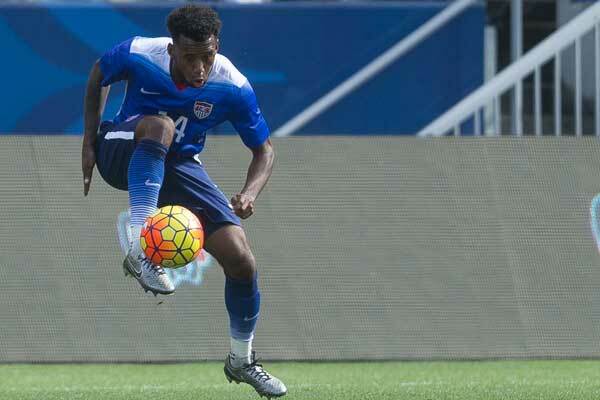 Named ussoccer.com’s MVP in the USA’s penultimate qualifier against Costa Rica, a 3-0 loss on October 8 in San Jose. 2004 – Made seven appearances. Played five of eight World Cup Qualifiers, adding two assists. Scored his sixth career international goal against Honduras on June 2. 2003 – Scored two goals and five assists in 11 games for the U.S.
2002 – Played 196 minutes in the World Cup including starts against Mexico and Germany. 2002 – Had two assists in U.S. 5-0 rout of Jamaica on May 16. 2002 – Scored third career goal for U.S. in 1-0 win over Ecuador in Birmingham. 2002 – Re-gained spot with national team in January helping to lead U.S. to Gold Cup title. 2000 – Started 11 of 13 matches for the U.S. on the left side of midfield. 1999 – Had a break-out year with the national side in 1999, registering four assists on the year, a team-high. 1999 – Part of the U.S. team that took the bronze medal in the Confederations Cup in Mexico. 1999 – Scored his first goal for the national team on February 21, 1999 against Chile. 1998 – After a two-year hiatus, made his second appearance with the full-national side in a 0-0 draw with Australia in San Jose, CA. 1996 – Made his international debut on October 16,1996, starting against Peru. 2010: Retired as a member of the LA Galaxy after making 13 appearances. 2009: Played in 27 games starting 23. 2008: Returned to MLS in late August, signing with the Galaxy and making eight appearances. 2007-08: Moved from newly demoted Leeds to newly promoted Premier League team Derby County, initially establishing himself as a starter in the struggling team before missing games through injury towards the end of 2007. Returning to his starting role in 2008, Lewis played well but Derby were relegated to The Championship. 2006-07: Couldn’t prevent financially troubled Leeds being relegated to League One, England’s third division. 2005-06 – Started all 26 of Leeds United’s league matches before the end of the year … Scored his first goal in a Leeds United uniform on Aug. 20 in a 2-0 win against Wolverhampton. 2004-05: Regular starter, picked up four goals before the winter break. Played in 40 League games, one FA Cup and two League Cup games. 2003-04: Scored six goals in 28 games for Preston. 2002-03: Scored six goals in 38 appearances for Preston. 2002: Moved to Preston North End for an undisclosed fee where he signed a three-year contract. 2000: Debuted with Fulham on March 22, 2000 against Barnsley. 2000: Signed with Fulham of the English First Division for a fee of $2 million. 1999: Named to the MLS Best XI. 1998: Finished second in minutes played in MLS with 2,835. 1997: Led the San Jose Clash in assists with 13. 1996: Made professional debut with San Jose Clash in the inaugural match of MLS. Youth and college: An excellent youth tennis player, Lewis exchanged his racket for cleats in high school for both soccer and football. Led UCLA in scoring in 1995 with 11 goals and 10 assists and finished his Bruin career with 30 goals and 28 assists.